While installing the software, you have an opportunity to choose whether it will be hidden from the user. There are two operation modes available – a visible one and a stealth one. If you don’t tick the “Show icon in menu bar” during software installation, the software will work in a stealth mode. Attention! You cannot change the settings in the already installed software and to do so, you will have to reinstall it. 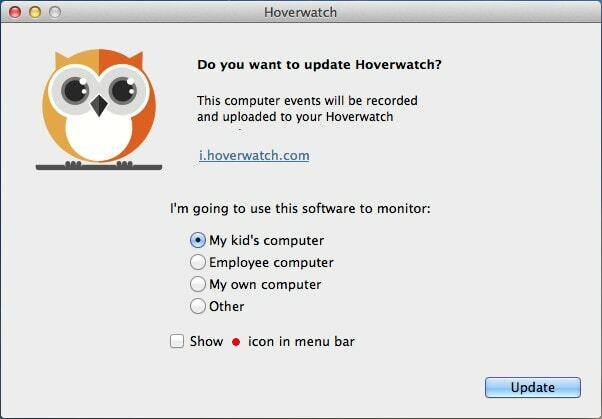 Invisibility is a useful feature of Hoverwatch software that allows you to get all the information you may need without worsening your relationship with the target device user. It’s natural that children want to be independent and have their own life, but sometimes they don’t make the best decisions. When you have an opportunity to view their activity in the invisible mode, you can make certain changes and protect them depending on what you see. If we talk about your employees, having software in the hidden mode is also very useful.